It's finally come, I've been waiting so long for this opportunity to announce the lucky winner of my Quilt Giveaway, and hopefully make someone's day. I was so touched by the number of wonderful comments many of you had left for me! When I stopped at midnight there was a total of 424 COMMENTS!! WOW! I won't ever touch Old Red Barn Co. comments :P but this was a great number for me! THANK YOU ALL! You all really have made my week. Congratulations Jennifer ms. Knitting mom of 3, please contact me either by email so I can get your color-scheme and have an early Present out to you! I'm sorry I couldn't pick everyone, but have no fear!---There is another quilt giveaway coming soon! If you scroll down and read my previous post you will see the picture of the quilt I will be giving away--- It was really hard for me to say only 1 person won, so that quilt-top will be split in half, quilted and batted for a generous size Crib or could easily be Lap Size--2 WINNERS this time! I can't wait for that. Please add me to your favorites or follow my blog to watch for that giveaway. Remember, the pattern for Brenda's Quilt, I've titled "With All My Heart" is now available in my etsy shop. 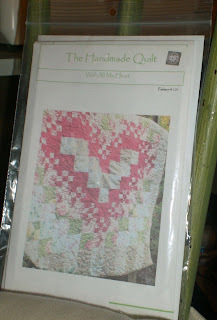 Visit http://www.thehandmadequilt.etsy.com/ or you can also click on the link in my sidebar. Thank you all again! I look forward to reading more of your comments and reading your blogs!! Congratulations to Jennifer! She's a lucky lady. Sure wish it had been me but congrats Jennifer! You are one lucky gal. I love the pattern - thanks for sharing it on Etsy. I am thinking pale green, muted reds and yellows -....mmmmmm yep! Hugs and thanks for the great giveaway. I'm going to check out the pattern and see if I can make one. It was a beautiful quilt. Congrats to Jennifer. Also, I love your playlist. An 80's retro mix. congrats jennifer, abbie i know she will love and treasure this handmade quilt. Congrats Jennifer. Happy you must be. Abbie that was fun and will be looking forward to the next time. Will stay tuned though. Enjoy your blog. Thanks for the opportunity. Oh my goodness I cannot believe I won. I am still is shock, happy, and crying. Thank You!! Congratulations, Jennifer! I'm happy for you! Thanks, Abbie, for hosting the giveaway - you are awesome! Abbie, that quilt was so beautiful. I kept seeing it pop up in posts and sidebars of the blogs I read! It was a great idea to sell the pattern. Yay for her and that you spread the word about a great cause!!! In the end so many will be winners!!! Well, if it couldn't be me, I am glad it was Jennifer! Congrats! Congratulations Jennifer! I'm so happy for you. Beautiful Quilt!! And also love the playlist. Love your blog!!! Nothing to do with quilts whatsoever - but Hi there! I'm a new member of SBS 26 and am just popping by to say hello. I'm amazed by your work - it's gorgeous, I tried quilting once and it's not for me LOL. Congrats!!! Enjoy and stay warm! Congratulations Jennifer! You are truly blessed :). Abby, Thanks for asking me to be a part of your quest to make those who are in pain feel a little bit better with a quilt. That is what it is all about. I am glad that I can help by donating some fabric. Good luck to you! !